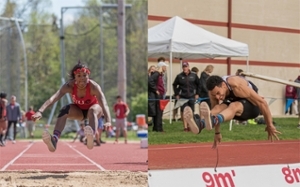 Julian Harvey and Brittney Gibbs of SIUE men’s and women’s track and field have added their marks to the international stage since the NCAA season ended. Harvey and Gibbs have qualified for the U.S. and Canadian Olympic Trials, respectively. Harvey, after becoming an All-American long-jumper at the NCAA Outdoor Championships in Eugene, Oregon, June 8, set his sights on the Olympic Trials to jump for the U.S.
His mark of 25 feet, 10.75 inches at the Ohio Valley Conference Indoor meet, where he was crowned the OVC champion, was enough to qualify for the Olympic Trials. Harvey’s personal best of 25-11.5 was above the legal limit for wind assistance. The U.S. trials take place at Hayward Field in Eugene, Oregon, where Harvey is seeded 22nd. He will compete July 2 at 3:45 p.m. (CT). If Harvey finishes in the top 12, he will advance to compete July 3 at 6:15 p.m. (CT). A Toronto, Ontario native, Gibbs added to the success of the jumping squad by qualifying for the Canadian Olympic Trials in the triple jump with a mark of 41-8.75, which she recorded at the NCAA West Preliminaries. She enters the trials seeded second. The Canadian Olympic Trials are held in Edmonton, Alberta. Gibbs will compete in the finals July 9 at 1 p.m. (CT).